11 of 12 of Georgia’s coal-fired power plants, including Plant Scherer, above, have contaminated groundwater with one or more toxic pollutants. Georgia’s coal-fired power plants, after decades of unsafe disposal of coal ash, have severely polluted the underlying groundwater. For the first time in 2018, utilities were forced to publicly report groundwater monitoring data on their websites because of new transparency requirements imposed by 2015 federal coal ash regulations. The Environmental Integrity Project and Earthjustice examined that data and determined that 92 percent (11 of 12) of Georgia’s coal-fired power plants have contaminated groundwater with one or more toxic pollutants. Ten of these 11 polluting plants are owned by a single company, Georgia Power. These findings place the State of Georgia at a crossroads: Will the State halt the widespread pollution of its aquifers and protect its rivers, lakes, and drinking water supplies? Or will the State continue to allow this toxic contamination to flow in perpetuity? The State this year proposed its own coal ash rules, but they fail to require utilities to remove waste from leaking, unlined coal ash ponds, which means the regulations are insufficient to protect or restore groundwater quality. The state regulations must be strengthened. 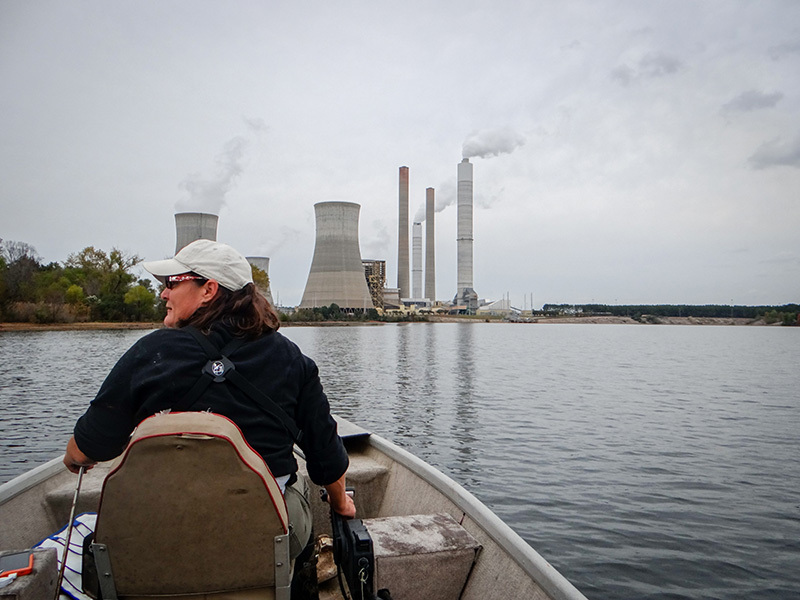 For decades, Georgia Power operated 11 power plants and disposed of millions of tons of toxic coal ash, primarily in unlined ponds, with little regulatory oversight by the Georgia Environmental Protection Division of the Georgia Department of Natural Resources (EPD), or the U.S. Environmental Protection Agency (EPA). Coal ash contains a brew of hazardous pollutants, such as arsenic, boron, cadmium, chromium, lead, radium, selenium and more, which can severely harm human health, fish and wildlife. The levels of multiple toxic pollutants found at Georgia plants exceed levels that are safe for human consumption. At Plant Yates, near Newnan, southwest of Atlanta, beryllium, boron and cobalt all exceed safe levels in one or more wells. Georgia’s problems, however, extend far beyond the current contamination of groundwater at the power plant sites. Georgia Power, which owns all of the contaminated sites, intends to close more than two dozen polluting ponds, but leave most of the coal ash in place. Because these ash ponds are located close to lakes and rivers and will continue to be inundated by groundwater, their contamination plumes will continue to flow into the State’s waters. Georgia Power recently admitted1 that the coal ash ponds at all of the above operating plants violate federal and state standards for safe siting by failing to separate ash from groundwater. In addition, nearby drinking water wells have not been tested, and it is possible that contamination may flow to communities who draw their drinking water from the aquifers. As a result of EPA's 2015 coal ash rule’s monitoring and reporting requirements, we now know the severity of the coal plants’ pollution of Georgia’s groundwater. Once groundwater is polluted, it is extremely difficult to stop the contamination unless the source of pollution is removed. Currently there are no plans by the polluter, Georgia Power, or the Georgia Environmental Protection Division (EPD) to require such removal. Our report presents a snapshot of the significant problem facing Georgia residents. Protection of the state’s rivers, lakes and drinking water sources is within reach, if prudent steps are taken now by the State of Georgia to require removal of the sources of toxic coal ash pollution and to strengthen the state’s coal ash permit program. Accordingly, this report includes specific recommendations that must be taken to protect Georgia water. If such actions are not taken, harm to Georgia’s water resources will continue, and coal ash contamination will endanger the state’s aquatic ecosystems and potentially the health of its residents. 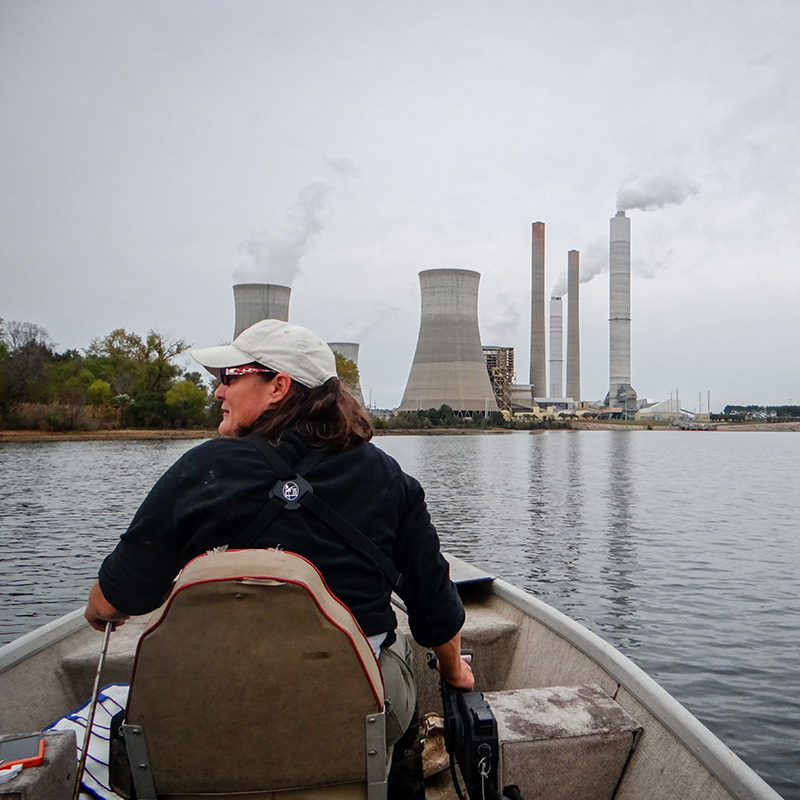 The Environmental Integrity Project and Earthjustice analyzed groundwater monitoring data from Georgia coal plants that became publicly available in March 2018 pursuant to the EPA’s federal coal ash rule (also known as the coal combustion residuals rule or “CCR rule”).2 All coal plants in Georgia subject to the CCR rule are owned and operated by Georgia Power, except one. Georgia Power made its new groundwater data available in a form that was very difficult to understand, and consequently the data required technical and legal analysis that the groups recently completed. The average length of the reports posted by Georgia Power was more than 2,400 pages.3 Data released by Georgia Power for three plants not subject to the CCR rule were also evaluated in this report. Antimony, which causes developmental toxicity (reduced fetal growth) and metabolic toxicity (reduced blood glucose levels). Antimony can also irritate the skin. Arsenic, which causes multiple types of cancer, neurological damage, and other health effects. Boron, which poses developmental risks to humans, such as low birth weight, and can result in stunted growth and plant toxicity in aquatic ecosystems. Cobalt, which harms the heart, blood, thyroid, and other parts of the body. Lithium, which presents multiple health risks including neurological impacts. Molybdenum, which damages the kidney and liver at high concentrations. Radium, which causes cancer and is a radioactive element. Selenium, which harms fish and other aquatic organisms at very low concentrations and is bioaccumulative. Selenium can also be toxic to humans. Sulfate, which causes diarrhea, and can be very dangerous to young children. We do not know the extent to which the tested groundwater is used for drinking, but regardless of use, these levels represent a significant deterioration of water quality by coal ash. Releases of these pollutants to the environment are particularly troublesome, because once they leach into groundwater, the harmful pollutants do not go away or degrade over time. As set forth in further detail below, Georgia Power’s ash pond closure plans largely entail dewatering and consolidation of coal ash on site in preexisting unlined ponds, then placement of a cover, or “cap” on top of the waste. While Georgia Power claims that its closure plans use “advanced engineering methods and technologies,” the plans generally call for little more than leaving the ash in the ground and placing a cap over the ash.4 This approach does not change the fact that the ponds will remain unlined, leaving the coal ash exposed to groundwater, nor does it change the fact that these massive waste repositories will remain near rivers, lakes, streams and other water sources throughout the state — in perpetuity. The federal coal ash rule requires groundwater monitoring in two phases. Phase one “detection” monitoring is intended to detect coal ash contamination by looking for early-warning coal ash indicators like boron and sulfate. If detection monitoring finds evidence of contamination, sites must initiate phase two “assessment” monitoring for a longer list of coal ash constituents. If assessment monitoring finds further evidence of contamination, then owners and operators must take steps to control the source, remediate groundwater, and in some cases close ash ponds. Georgia Power has acknowledged that the contamination around its ash ponds is probably caused by coal ash and has initiated phase two assessment monitoring at most of the ponds. Assessment monitoring will likely find significantly elevated levels of multiple coal ash pollutants, and consequently the federal rule will require Georgia Power to take corrective action (cleanup). Georgia Power has been less forthcoming about contamination around its ash landfills. Although phase one detection monitoring typically shows evidence of contamination at the landfills, Georgia Power has not initiated assessment monitoring at any landfills and has not even acknowledged the existence of a landfill at Plant Yates that appears to be receiving coal ash from the ponds at that site. Failure to initiate assessment monitoring at Georgia Power’s leaking landfills at Plants Bowen, Hammond, and McIntosh may be a violation of the federal CCR rule. Georgia Power should be performing assessment monitoring at all of its coal ash disposal units, including landfills, and must take steps to stop the contamination leaking from coal ash ponds and landfills before expanding toxic groundwater plumes become more difficult, or impossible, to manage. In some cases, both detection monitoring and assessment monitoring will fail to show statistically significant downgradient contamination — even if it exists — because the so-called “upgradient” or “background” wells that are used as a point of comparison are affected by coal ash. Contamination in upgradient wells often comes from unregulated coal ash units, such as long-abandoned coal ash landfills. Sometimes the background well is affected by the regulated coal ash unit, and is not in fact upgradient at all. This happens when a well is located too close to a unit, and/or when the groundwater flows radially away from the unit (because of groundwater “mounding”). The solution to this problem is to have Georgia regulate coal ash contamination at the site level, rather than at the level of coal ash units. If groundwater at a coal plant shows coal ash contamination, the owner should be required to clean up the source, regardless of whether the coal ash is in a unit that would be regulated by the CCR rule. Georgia has the authority to go beyond the requirements of the CCR rule, and should do so. 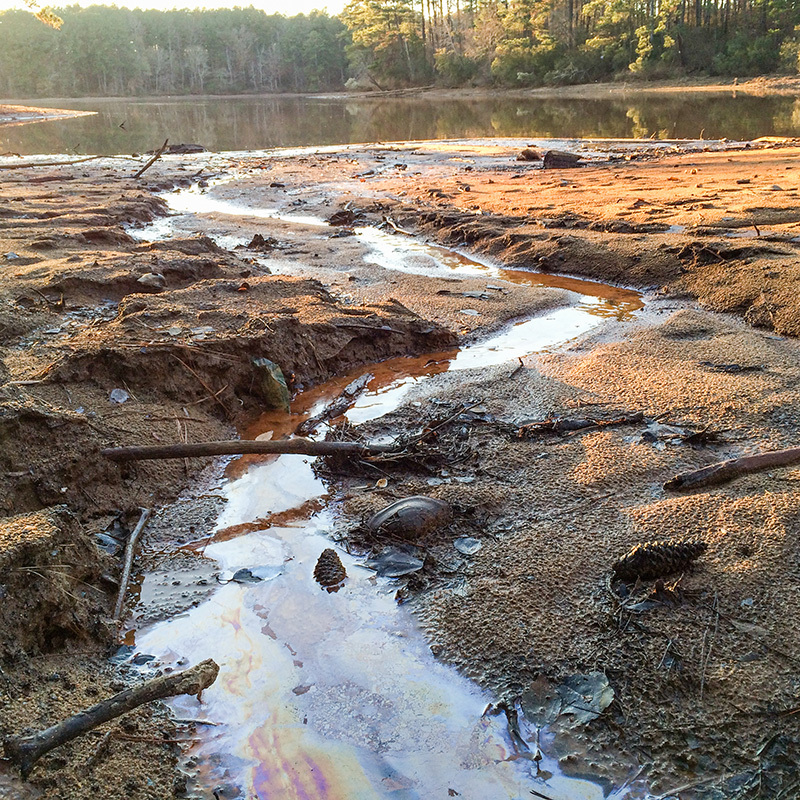 Failure to address all sources of coal ash will fail to restore groundwater quality. We evaluate groundwater data in three ways. We also evaluated each detection monitoring pollutant to see whether downgradient concentrations are likely to exceed upgradient concentrations, producing a Statistically Significant Increase (SSI) and triggering assessment monitoring. In some cases, owners acknowledged detection monitoring SSIs, either explicitly, or by posting a notice of assessment monitoring. We did not attempt to calculate SSIs — each site has selected its own statistical method and the calculations would have been too onerous — but in order to get a sense of whether an SSI was likely, we compared the mean value of each pollutant in each downgradient well to the maximum upgradient value for the coal ash unit in question. We assume that when a pollutant is, on average, elevated above the maximum upgradient result, then that pollutant is significantly elevated. Finally, we evaluated assessment monitoring pollutants to get a sense of whether assessment monitoring is likely to find SSIs. Strictly speaking, each owner will be using new data for their assessment monitoring analyses (i.e., data collected after the eight initial samples required by the CCR rule). But we assume that groundwater quality will not improve significantly between, for example, 2016 and 2018, and that the initial sampling results provide a reliable indicator of current groundwater quality. If upgradient data for a given pollutant are all below that pollutant’s groundwater protection standard, then we assume that the pollutant’s groundwater protection standard is equal to the presumptive standard shown in Table 1. In this case, any downgradient result greater than the presumptive standard is a likely SSI. If upgradient data tend to exceed the presumptive groundwater standard for a given pollutant, then we assume that the standard for that pollutant will be set at background. In this case, we assume there will be an SSI if a mean downgradient concentration exceeds the upgradient maximum for that coal ash unit. The groundwater at Plant Bowen is currently unsafe. 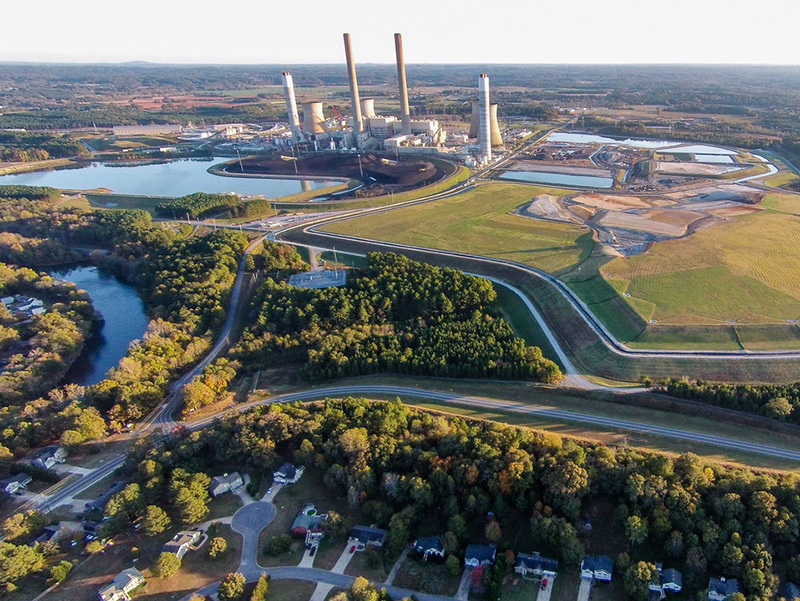 Plant Bowen has had one catastrophic spill in 2002, when a four-acre sinkhole beneath its coal ash pond caused two million pounds of coal ash (260 pounds of arsenic) to enter a tributary of the Etowah River. Georgia Power’s Plant Bowen is located nine miles southwest of Cartersville, Georgia, near Euharlee. The plant started operation in 1975 and is the fourth largest coal-fired power plant in the U.S., capable of producing 3376 MW (megawatts) of electricity. For purposes of CCR rule compliance, there are four coal ash units at Bowen, including one unlined ash pond (Ash Pond 1) and three unlined landfill areas (“Landfill Cells 1 & 2,” “Landfill Cells 3 & 4,” and “Landfill Cells 9 & 10”). 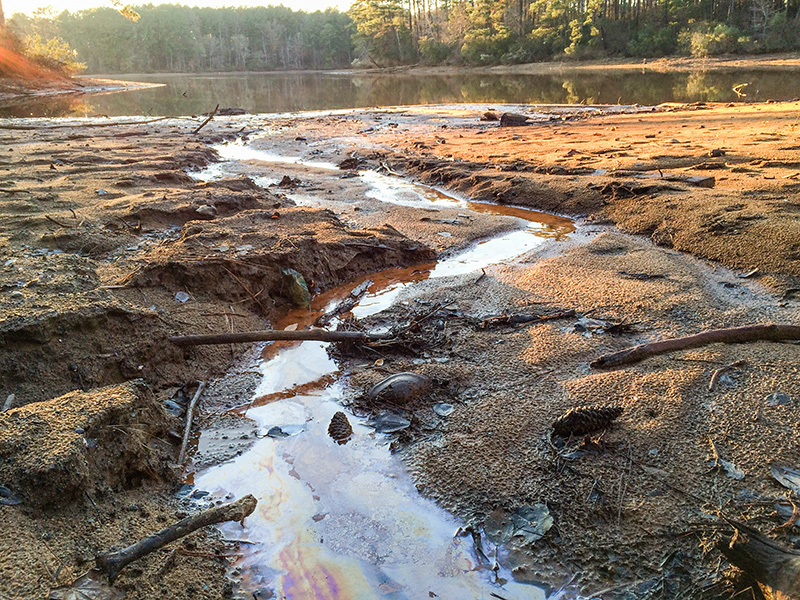 The 257-acre, significant hazard ash pond is located approximately 100 feet from the Etowah River, the drinking water source for 130,000 residents of Cherokee County.11 Plant Bowen has had one catastrophic spill in 2002, when a four-acre sinkhole beneath its coal ash pond caused two million pounds of coal ash (260 pounds of arsenic) to enter a tributary of the Etowah River. The spill caused the level of arsenic in the river to rise to 1250 ppb, exceeding federal drinking water standards by more than 120 times and causing downstream drinking water intakes to suspend operation.12 The ash pond currently holds about 21.4 million cubic yards of coal ash. The groundwater at Plant Bowen is currently unsafe, particularly around the southwest corner of the ash pond complex, downgradient of the “recycle pond.” The 2017 annual groundwater report notes that there is an “apparent component of groundwater flow to the southwest in that area.” Most of the wells that Georgia Power designated as “upgradient” are located southwest of the recycle pond and have elevated concentrations of boron and sulfate. These wells appear to be affected by coal ash contamination and are probably not, in fact, upgradient. In downgradient wells, boron has reached more than ten times the safe level, and antimony exceeds its standard by up to three times. Ash Pond. Georgia Power’s statistical analysis of detection monitoring data found “Statistically Significant Increases” (SSIs) for all of the detection monitoring contaminants at the ash pond in multiple wells, and the pond is now in assessment monitoring. 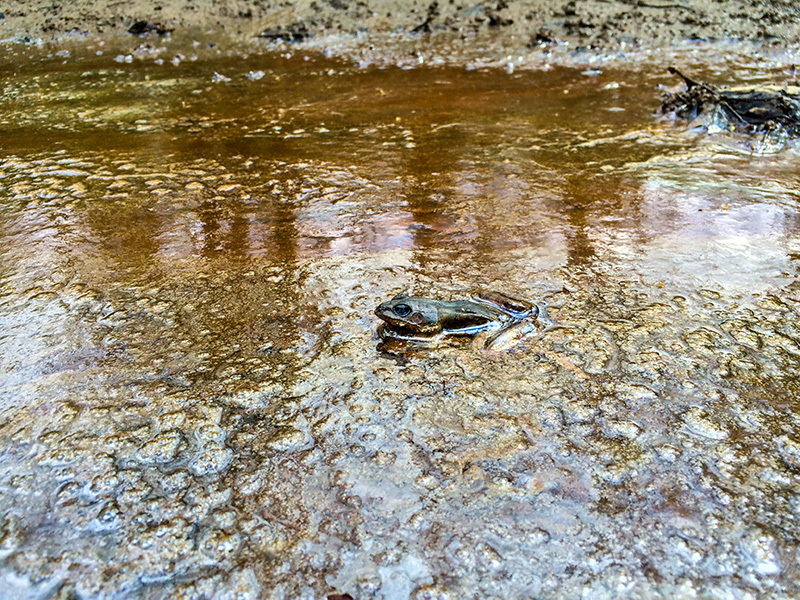 Assessment monitoring at the ash pond is likely to find SSIs for arsenic, cobalt, thallium, and radium, all of which have exceeded their groundwater protection standards. Corrective action is likely to be required at the Ash Pond. Georgia Power intends to close the plant’s leaking 254-acre ash pond by excavating the entirety of the 21 million cubic yards (tons) of coal ash and “consolidating the excavated CCR [coal ash] into an approximately 144-acre fully-lined” disposal facility situated within the current footprint of the pond. This plan represents a change in Georgia Power’s original plans to leave the ash in place.16 However, the ground beneath the pond is unstable and vulnerable to sinkholes, as evidenced by the 4-acre sinkhole that caused the 2002 coal ash spill described above. In fact, Georgia Power has admitted that the ash pond cannot meet federal and state siting standards because of the unstable ground.17 Georgia Power has also admitted that the ash pond cannot meet federal and state standards because the unlined pond is currently in contact with the underlying groundwater. It is therefore unclear how a safe and secure disposal facility could be built in the current footprint of the existing pond. Great care must be taken to ensure the new facility is built on stable ground and that the bottom liner of the facility is at least five feet from the uppermost aquifer. 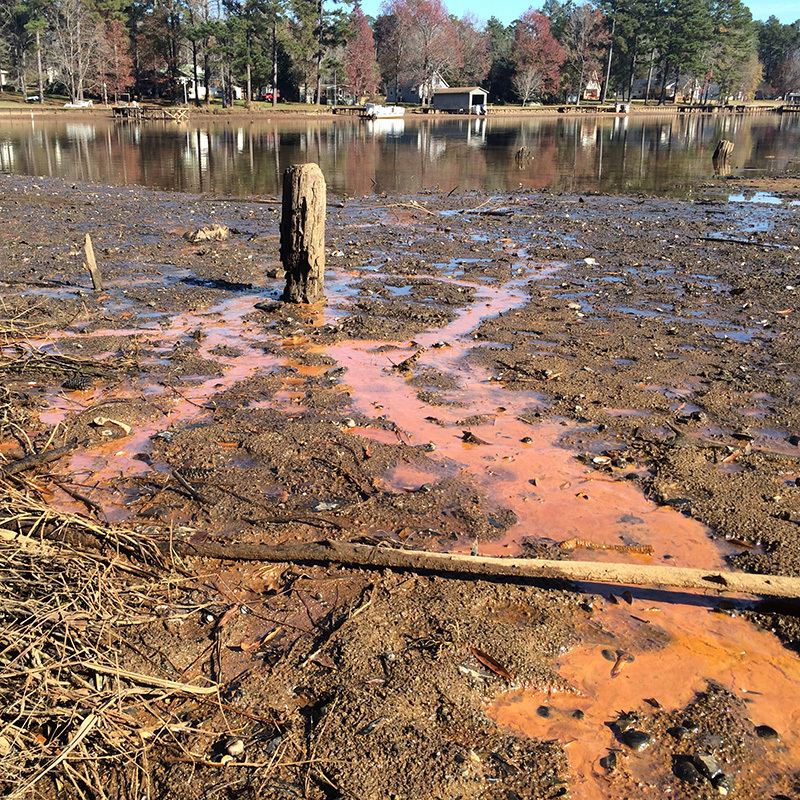 Contaminated groundwater seeping out of the banks and into Lake Sinclair, near Plant Harllee Branch, Dec. 9, 2015. Because Plant Branch was retired in 2015, Georgia Power maintains that the CCR rule does not apply to its ash pits at this site.19 This means that many of the documents posted for regulated coal plants (annual groundwater monitoring reports, documentation of history of construction and liner type, etc.) are not available for this plant under the public disclosure requirements of the CCR rule. In particular, we do not know which wells are intended to be upgradient or background wells, or where the wells are located relative to onsite ash ponds. However, Georgia Power has posted groundwater monitoring data for Plant Branch as part of its ash pond closure process, which, coupled with prior records described above, is enough to establish that the groundwater is contaminated with coal ash constituents and unsafe.20 The pollutants presenting a risk at Plant Branch include beryllium in one well and cobalt in multiple wells. In one well, cobalt levels are nearly 50 times the safe drinking water level. 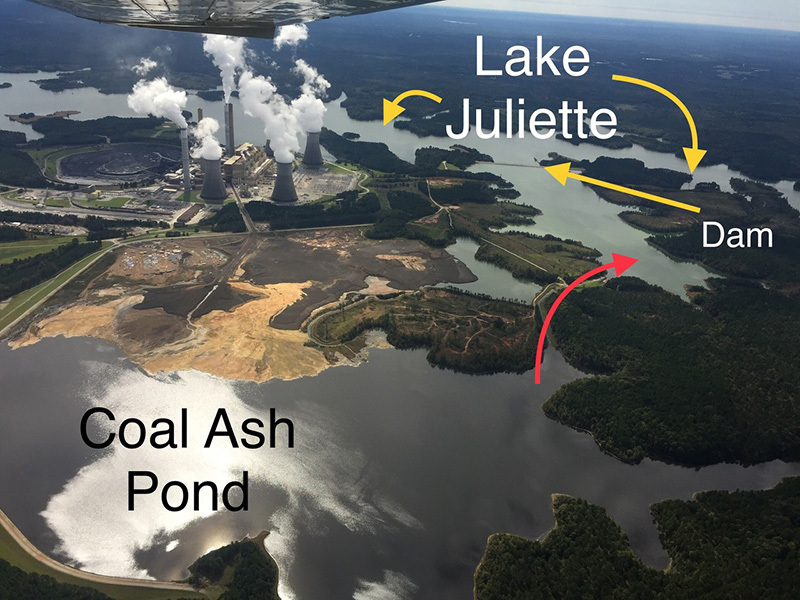 There are four ash ponds at Plant Branch, and Georgia Power, until August 2018, planned to close these ponds by consolidating all of the ash in one unlined, high hazard pond known as Pond E.
Groundwater impacts from pollutants commonly associated with coal ash have been detected near the Branch ash ponds in the past. In 1994, Georgia Power submitted a Release Notification under Georgia’s Hazardous Sites Response Act for Plant Branch, listing concentrations in excess of background in groundwater for barium, chromium, copper, lead, and nickel detected in a temporary well west of Pond E. The Notification also listed arsenic, barium, beryllium, cadmium, chromium, copper, lead, mercury, nickel, silver, and zinc in a temporary well located west of Pond D, and barium, copper, and lead in a temporary well southeast of Pond C. Subsequently, in 2002, Georgia Power was successful in having Georgia EPD accept a “corrective action plan” entailing semi-annual monitoring for nickel only, to ensure compliance with “Type 4” “risk reduction standards,” a site-specific risk assessment for non-residential properties. It appears that this semi-annual monitoring was later discontinued. Georgia Power recently amended its closure plan for Plant Branch. The company now plans to excavate all the ash from the ponds onsite and then store the 11.5 million tons of coal ash in a new, lined landfill on plant property. This landfill will be regulated and permitted by Georgia EPD. The Crisp Plant, located near Warwick, Georgia, was built in 1957. It is owned and operated by the Crisp County Power Commission (CCPC). 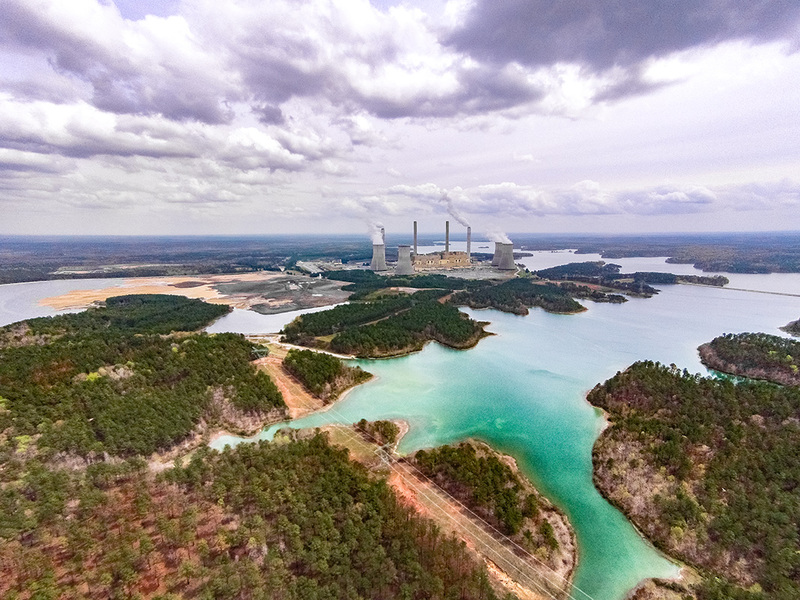 The plant is considerably smaller than all other Georgia coal plants and generates only about 12.5 MW of electricity. 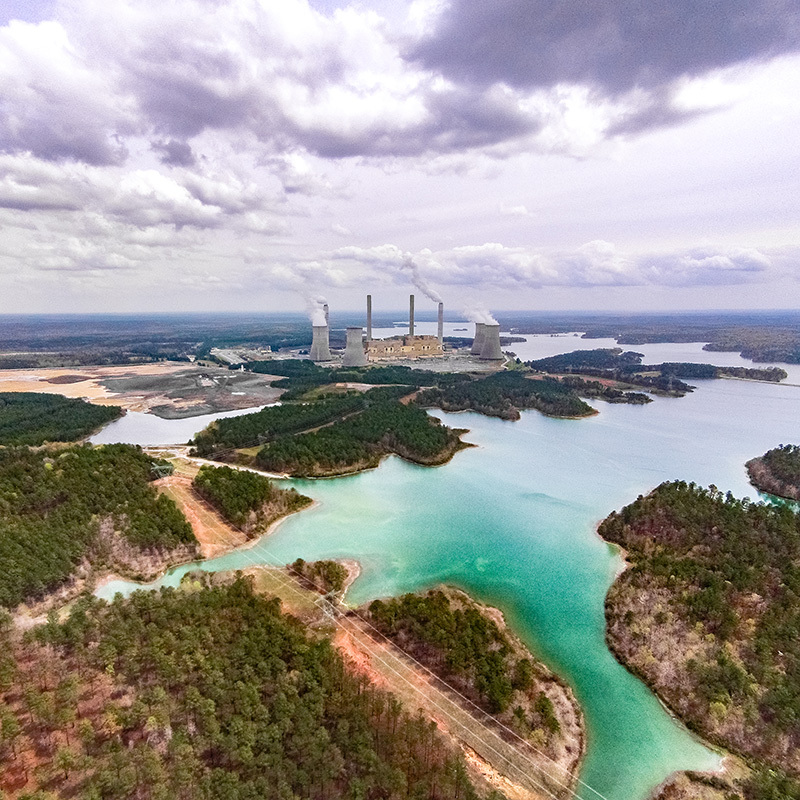 Plant Crisp is the only power plant in Georgia featuring a coal ash disposal unit that is not owned and operated by Georgia Power. For purposes of CCR rule compliance, there is an unlined ash pond of approximately 6.1 acres located near Lake Blackshear and the Flint River, which was constructed in the mid-1970s. The Commission monitors groundwater around the ash pond with four wells, one upgradient and three downgradient. The groundwater in these wells does not appear to be unsafe, but as described in more detail below, it does appear to be affected by the ash pond. Detection monitoring results show SSIs for multiple constituents, including boron, chloride, and sulfate. It does therefore appear that the ash pond is leaking into the groundwater. Although the site should be in assessment monitoring, the Crisp County Power Commission has not posted an assessment monitoring notice. Failure to conduct assessment monitoring, when triggered by a SSI, is a violation of the federal CCR rule. CCPC intends to close its ash pond by removing the ash and disposing of it off-site.22 The removal of the coal ash from the unlined impoundment will likely to prevent long-term contamination of the site. Contaminated water at Plant Hammond. The groundwater at Hammond is unsafe. Pollutants present at unsafe levels include arsenic, boron, cobalt, molybdenum and sulfate. Georgia Power’s Plant Hammond is a coal-fired power plant located on 1,100 acres in Floyd County, approximately 10 miles west of Rome. The plant began operating in 1954, and its four units can produce 843 MW of electricity. 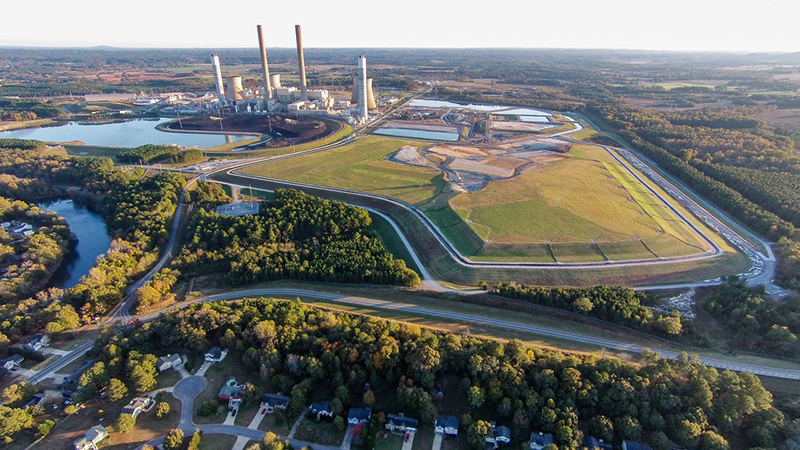 For purposes of CCR rule compliance, there are three coal ash units at Hammond, including two unlined ash ponds (Ash Ponds 1 and 2) and one landfill that contains over 600,000 cubic yards of ash. There is also a third large unlined ash pond at Hammond (“Ash Pond 3”), which contains over a million cubic yards (tons) of coal ash, but due to an extension in the coal ash rule for certain impoundments, Georgia Power does not yet have to post groundwater data for the third pond. The ash ponds are located just 150 to 375 feet north of the Coosa River. The groundwater at Hammond is unsafe, particularly in the vicinity of Ash Ponds 1 and 2. Pollutants present at unsafe levels include arsenic, boron, cobalt, molybdenum and sulfate.23 Ash Pond 1 is notable for having very high concentrations of both arsenic and molybdenum. Arsenic concentrations in well HGWC-13, on the southwest corner of Ash Pond 1, are more than 30 times higher than the Maximum Contaminant Level (federal drinking water standard) for arsenic. Molybdenum concentrations in HGWC-8, on the eastern side of Ash Pond 1, are more than 10 times higher than EPA’s lifetime health advisory for that chemical. Ash Ponds. In its annual groundwater monitoring reports for Plant Hammond, Georgia Power noted that there were SSIs for multiple pollutants in multiple wells at Ash Ponds 1 and 2, and has posted notices of assessment monitoring for both ponds. In assessment monitoring, Georgia Power is likely to find SSIs for arsenic, cobalt and molybdenum, all of which exceed their groundwater protection standards in one or more wells. The maximum arsenic level in the groundwater exceeds the MCL by more than 42 times, and cobalt and molybdenum exceed health thresholds by more than 37 and 5 times, respectively. Consequently, Georgia Power will probably have to take corrective action at the two ash ponds. Landfill. Georgia Power found SSIs for total dissolved solids (“TDS”) in two wells at the Huffaker Road Landfill during detection monitoring, but has not posted a notice of assessment monitoring for that unit. If Georgia Power did conduct assessment monitoring around the landfill, they would likely find SSIs for cobalt; Georgia Power would then have to take corrective action. Failure to timely determine a SSI and to conduct assessment monitoring, when triggered by a SSI, is a violation of the federal CCR rule. Georgia Power intends to close its largest coal ash pond at Plant Hammond (Ash Pond 3) in place by removing only the water from the pond and installing a cover over the coal ash.24 This ash pond currently contains over 1.2 million cubic yards (tons) of ash buried 44 feet deep into the ground next to the Coosa River. If the ash is in contact with underlying groundwater, toxic contaminants will continue to leak indefinitely into the groundwater after the cap is installed. The polluted groundwater is likely to flow offsite into the nearby Coosa River, just a few hundred feet from the pond. Georgia Power retired its coal-fired units at Plant McDonough in 2011 and currently operates three natural gas units at the site. Plant McDonough operated four unlined ash ponds at the site, including two very large high hazard ponds bounded by the Chattahoochee River. The ponds, which are being consolidated onsite and closed in place, hold a total of 4.9 million cubic yards (tons) of coal ash. Georgia Power’s closure plans for the ponds do not provide detailed information concerning the consolidation and closure-in-place of the 4,900,000 tons of ash.26 However, the closure plan for Ponds AP-3 and AP-4 indicates that the closed pond will cover 64 acres.27 Georgia Power admits that the depth of ponds AP-3 and AP-4 are 74 and 120 feet, respectively.28 Consequently it is likely that these ash dumps are intersecting groundwater. It is almost a certainty that contamination (e.g., arsenic, beryllium, boron, cobalt, lithium, radium, selenium) will continue to leak from these unlined ponds into the groundwater. Leaving the ash in place in these deep, unlined ash ponds will likely create a permanent source of groundwater contamination from the site. Georgia Power’s Plant Kraft is a retired coal plant at the Port of Savannah at Port Wentworth, 18 miles downriver from Plant McIntosh on the Savannah River. Georgia Power operated the 208-MW plant from 1968 to 2015. All coal ash has been removed from the ash ponds at Plant Kraft.30 Despite the removal of the source of contamination (coal ash) from the site, Georgia Power should address current groundwater contamination caused by the coal ash. Georgia Power’s Plant McIntosh is located in Effingham County near Rincon, Georgia along the Savannah River. This plant has been operating since 1979 and has a 178 MW generating capacity. There are two regulated coal ash units at Plant McIntosh, “Ash Pond 1” and “Landfill 4.” The groundwater around Ash Pond 1 is unsafe for drinking, with elevated concentrations of arsenic, boron, cobalt, and lithium. The highest onsite arsenic concentrations are in a well that is designated “upgradient,” (MGWA-6), but that well is right on the edge of the ash pond and has higher boron and sulfate concentrations than the other upgradient wells. Well MGWA-6 is therefore probably not truly upgradient and is instead likely affected by the ash pond. Ash Pond. The results of Georgia Power’s statistical analyses for McIntosh are not provided in the annual groundwater monitoring reports for Ash Pond 1 and Landfill 4, but the data suggest that there were detection monitoring SSIs for most or all detection monitoring pollutants at the ash pond. Georgia Power presumably found the same, and Ash Pond 1 is now in assessment monitoring. Assessment monitoring at Ash Pond 1 will likely find SSIs for cadmium, cobalt and lithium, which should trigger corrective action. Landfill. Detection monitoring data from Landfill 4 showed elevated calcium, fluoride, total dissolved solids, and, in one well each, boron and chloride. The landfill should be in assessment monitoring, but it appears that Georgia Power has not taken that step. If Georgia Power did conduct assessment monitoring at the landfill, it would likely find SSIs for chromium and cobalt in one or more wells, which would then trigger corrective action. Failure to timely determine a SSI and to conduct assessment monitoring, when triggered by a SSI, is a violation of the federal CCR rule. Georgia Power intends to remove the remaining 90,000 cubic yards of coal ash from Ash Pond 1 prior to closure of the site.31 This method of “clean closure” should help to prevent future contamination of the groundwater from the closed pond. Georgia Power should, however, clean up the high levels of toxic metals currently present in the groundwater at the site. 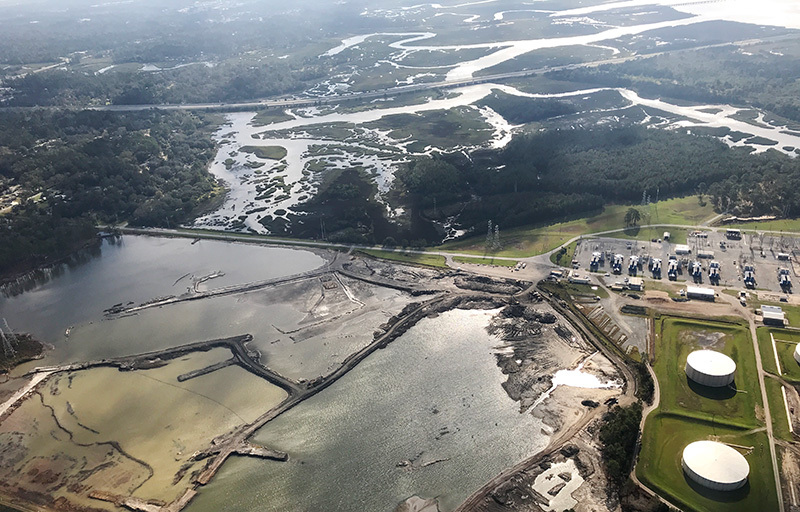 At Plant McManus, unknown amounts of coal ash spilled into Georgia’s Golden Isles during Hurricane Irma in 2017. Georgia Power’s Plant McManus is located on 900 acres of land known as Crispen Island on the Turtle River near Brunswick. The coal plant started operation in the 1950s, but its two coal boilers (122 MW) ceased burning coal in 1971. Plant McManus currently operates nine oil-fired combustion turbines. For the purposes of the CCR rule, Plant McManus has one unlined, significant hazard coal ash pond that is undergoing closure by removal. 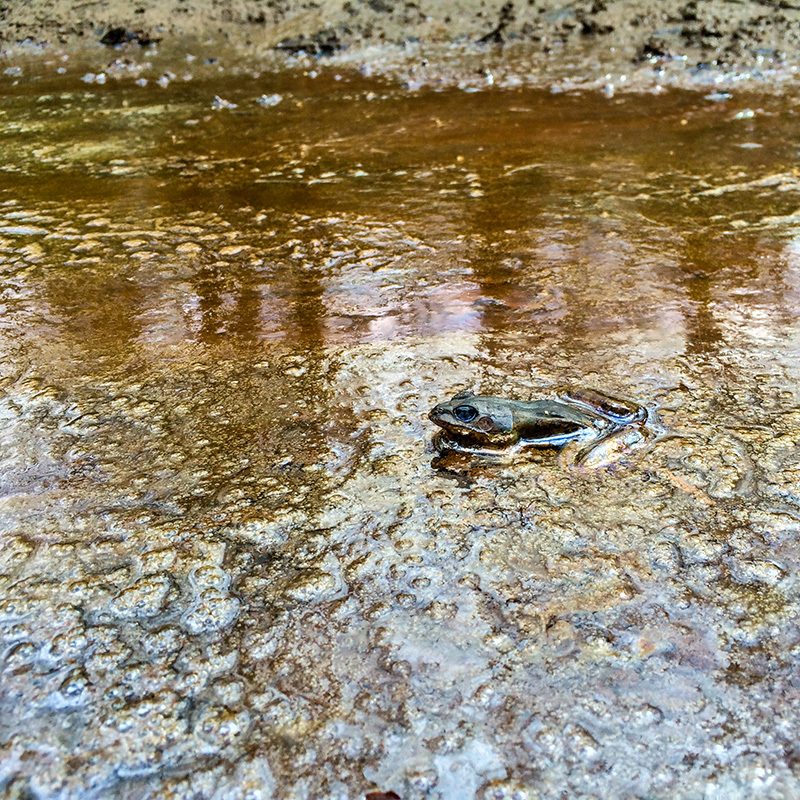 As of March 2018, the pond was dewatered and 60 percent of the ash was removed. Georgia Power does not believe that the plant is subject to the CCR rule, but has posted groundwater monitoring data on its website.32 The data show that the groundwater is contaminated with coal ash constituents and unsafe. Among other pollutants presenting a health risk, arsenic concentrations have reached levels of more than 400 μg/L (40 times the MCL for arsenic). Removal of coal ash from the ash pond should help prevent future contamination of the site from that pond. Georgia Power should, however, clean up the high levels of toxins, including arsenic, that have already polluted groundwater at the site. Altahama Riverkeeper Jen Hilburn near Plant Scherer. The groundwater at Plant Scherer is unsafe, particularly around the ash pond. Georgia Power’s Plant Scherer, located in Juliette, GA, is the largest coal-fired power plant in the United States. The plant began operation in 1982 and is situated on the shores of Lake Juliette. The four units of Plant Scherer are capable of producing nearly 3,600 MW of electricity. Plant Scherer has three regulated coal ash units, including an unlined, high-hazard ash pond (AP-1), which contains more than 30 million cubic yards (tons) of ash and wastewater. The plant also operates a large ash landfill with two units that are analyzed separately (Cell 1 and PAC Ash Cell). The groundwater at Plant Scherer is unsafe, particularly around the ash pond, with unsafe cobalt concentrations in multiple wells and unsafe boron concentrations in one well. Cobalt concentrations are frequently 10 or 20 times higher than EPA’s health-based standard. The polluted groundwater is likely to flow offsite into the nearby Lake Juliette or to wells, if any drinking water wells are within the plume of contamination. Ash Pond. Georgia Power’s statistical analyses of detection monitoring data found multiple SSIs at the ash pond, and Georgia Power has initiated assessment monitoring. The results of assessment monitoring will likely find multiple SSIs for cobalt, which will then trigger corrective action. Landfill. Detection monitoring at the landfill found multiple SSIs, for boron, calcium, chloride, sulfate, and total dissolved solids, but Georgia Power does not appear to have initiated assessment monitoring. If it did conduct assessment monitoring, Georgia Power would likely find cobalt SSIs at one or more downgradient wells, which would then trigger corrective action. Failure to conduct assessment monitoring, when triggered by a SSI, is a violation of the federal CCR rule. Georgia Power intends to close the 553-acre ash pond by leaving the ash in place.35 The current volume of ash in the pond is 15,462,000 cubic yards (tons), and the pond is about 63 feet deep.36 Georgia Power’s closure plan indicates that some unspecified “consolidation” of ash will take place, but no ash will be removed off-site. The coal ash is currently in contact with underlying groundwater, therefore toxic contaminants will continue to leak indefinitely into the groundwater after the cap is installed. The polluted groundwater is likely to flow offsite into the nearby Lake Juliette or to wells, if any drinking water wells are within the plume of contamination. Georgia Power’s Plant Wansley is located on 5,200 acres in Heard and Carroll counties near Carrollton along the Chattahoochee River. The facility, which began commercial operations in 1976, is capable of producing nearly 1,900 MW of electricity. Plant Wansley has two regulated coal ash units. The first is a large, unlined ash pond, containing nearly 25 million cubic yards (tons) of coal ash and wastewater. The pond is surrounded by twenty wells, eight upgradient and twelve downgradient. The second regulated unit is a landfill complex consisting of three distinct cells. The landfill complex is monitored by 35 wells, six of which are situated along the upgradient edge of the landfills. The groundwater at Plant Wansley is unsafe to drink, with unsafe levels of one or more pollutants in many wells. Although some of the high-cobalt wells are upgradient of the ash pond or the landfill, the highest concentrations are in wells downgradient of the landfill. Specifically, cobalt concentrations average 65 and 144 micrograms per liter in wells GWC-9 and GWC-14, respectively. These levels are ten to twenty times higher than the EPA Regional Screening Level for cobalt, and ten to twenty times higher than the highest concentrations upgradient of the landfill. These two wells also have elevated levels of boron, suggesting a coal ash-related source. The landfill therefore appears to be adding a substantial amount of cobalt to the local groundwater. Other pollutants found at unsafe levels include boron, lithium, radium, and sulfate. Ash Pond. Wells around the ash pond show elevated boron, calcium, chloride, fluoride, sulfate, and TDS in one or more downgradient wells that exceed the highest upgradient readings. Georgia Power identified multiple SSIs in the annual groundwater monitoring report for the ash pond for boron, calcium, chloride, fluoride, sulfate, and total dissolved solids, and has placed the unit in assessment monitoring. Once in assessment monitoring, Georgia Power will likely find multiple SSIs for lithium, which frequently exceeds its likely groundwater standard in downgradient wells, and will then have to take corrective action. Landfill. There were also several detection monitoring SSIs at the landfill, including boron in wells GWC-9 and GWC-14 (two wells with dramatically elevated cobalt concentrations), chloride in well GWC-14, and fluoride in well GWC-32. Yet despite these SSIs, Georgia Power does not appear to have initiated assessment monitoring at the landfill. If it did conduct assessment monitoring at the landfill, it would likely find multiple SSIs for cobalt, and may also find SSI for fluoride or radium. These SSIs would then trigger corrective action. Failure to timely determine a SSI and to conduct assessment monitoring, when triggered by a SSI, is a violation of the federal CCR rule. Georgia Power intends to close the 343-acre ash pond by leaving the ash in place.37 The current volume of ash in the pond is 14,467,164 cubic yards (tons), and the pond is about 98 feet deep.38 Georgia Power’s closure plan indicates that some unspecified “consolidation” of ash will take place, but no ash will be removed off-site. The coal ash is currently in contact with underlying groundwater, therefore toxic contaminants will continue to leak indefinitely into the groundwater after the cap is installed. The polluted groundwater is likely to flow offsite into the Chattahoochee River or to wells, if any drinking water wells are within the plume of contamination. Georgia Power’s Plant Yates is located near Newnan, GA, on the Chattahoochee River. The plant began operation in 1950. Georgia Power retired Plant Yates’ coal-fired units one through five in 2015, and the remaining two units are fueled by natural gas. Plant Yates has six unlined coal ash ponds in various states of operation, and one or more coal ash landfills. Plant Yates’ largest ash pond, AP 2, contains over 1.5 million cubic yards (tons) of ash and wastewater and sits just 100 feet from the Chattahoochee River. Two ash ponds (Ash Pond A and Ash Pond 1) have been excavated and, according to Georgia Power, no longer contain coal ash. However, some of the ash from these ponds was apparently placed in a “permitted dry ash landfill located within the boundary of Plant Yates.”39 The ash was moved between 2015 and 2017, which means that the landfill was active when the CCR Rule was finalized. The landfill is therefore subject to the CCR Rule, yet Georgia Power does not list any landfills among the regulated units, and has not posted any groundwater monitoring information. Coal ash from one or more of these sources has contaminated the groundwater with unsafe levels of beryllium, boron, cobalt, and sulfate. Georgia Power will probably have to take corrective action with regard to Ash Ponds 2, 3, and B/B’. Georgia Power should also be monitoring the groundwater around the onsite coal ash landfill(s). Ash Pond 2 is monitored with a separate network of wells. 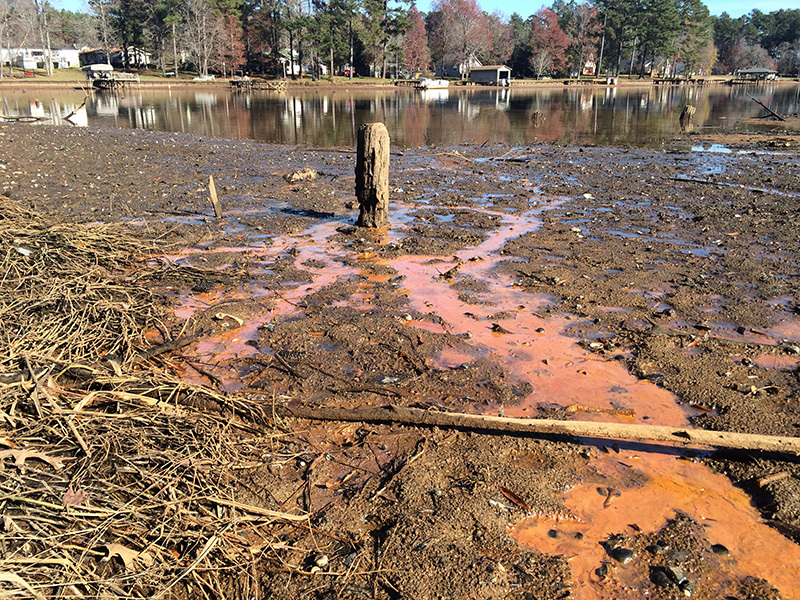 All of the wells located between Ash Pond 2 and the Chattahoochee River show signs of contamination, with elevated levels of boron, chloride, sulfate, and other pollutants. Ash Pond 2 is now in assessment monitoring, and Georgia Power will likely find SSIs for cobalt or radium. Ash Pond 2 is also unlined, and will therefore have to be closed or retrofitted. As stated above, the landfill at Plant Yates appears to be a regulated landfill subject to the federal coal ash rule, but, to date, Georgia Power has not complied with multiple federal requirements applicable to the landfill. Georgia Power intends to close three of the six ash ponds at Plant Yates by leaving the ash in place.41 The current volume of ash in the three ponds exceeds two million cubic yards, and the ponds range from 7 to 27 feet deep.42 The coal ash is currently in contact with underlying groundwater, therefore toxic contaminants will continue to leak indefinitely into the groundwater after the cap is installed. The polluted groundwater is likely to flow offsite into the Chattahoochee River or to wells, if any drinking water wells are within the plume of contamination. Nationwide, the burden of coal ash pollution is carried disproportionately by communities of color and low-income communities. This is also true at many coal plants in Georgia. Populations of people of color and/or low-income residents are higher than the state average at seven of the ten Georgia coal plants with residential populations within one mile of their coal ash dumps. 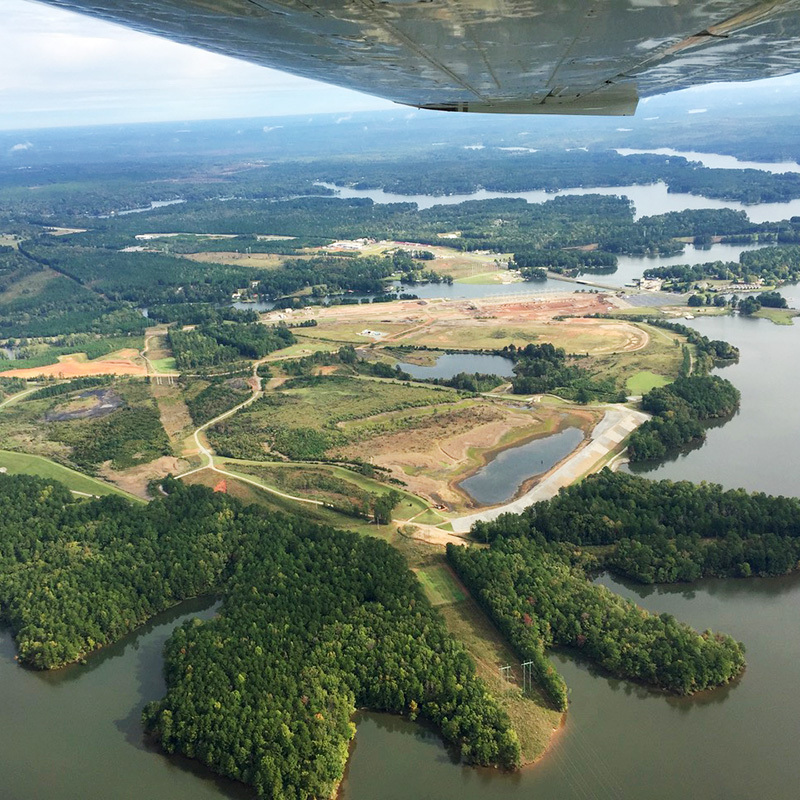 At five of the plants with a disproportionate impact, groundwater contamination will likely persist after closure of the ash ponds, because ash will be closed in place at Plants Bowen, Hammond, McDonough, Scherer, and Yates. Georgia’s groundwater has been severely harmed by coal ash pollution, and the water remains at risk. 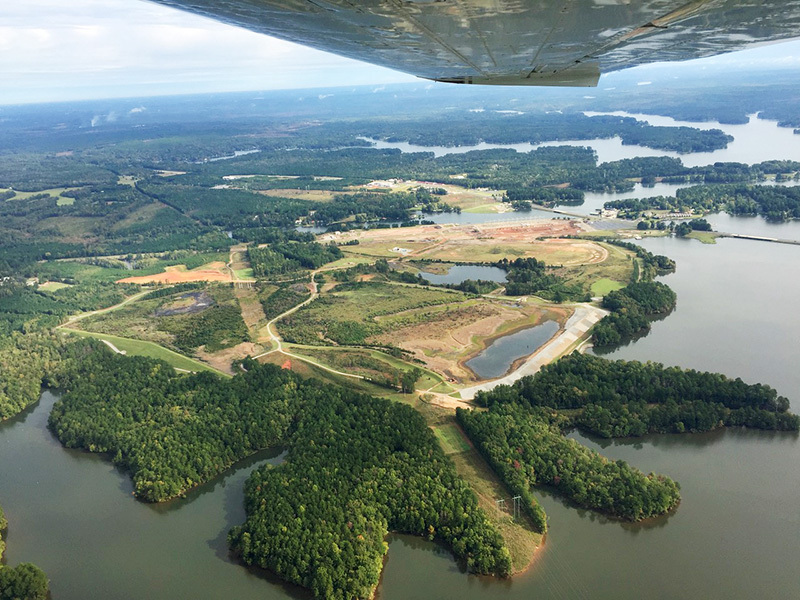 If coal ash remains in contact with groundwater and timely cleanups are not completed, contamination will continue to endanger sources of drinking water as well as nearby lakes and rivers. This pollution disproportionately impacts low-income communities and/or communities of color. The widespread nature of the pollution threatens to harm the quality of life for all Georgians who value clean water and healthy rivers and lakes. Require removal of coal ash from unlined ponds and landfills, particularly where the ash is in contact with or in proximity to underlying groundwater. EPD must require closure of all unlined ash ponds by a date certain and require coal ash disposal in lined, engineered landfills sufficiently distant from groundwater and surface water to prevent adverse impacts. Require monitoring, cleanup and closure at all leaking coal ash ponds and landfills, even those that are considered “closed” but which still contain coal ash. Require testing of all residential and municipal drinking water wells within one-half mile of coal ash ponds and landfills to determine if pollutants are impacting drinking water. Guarantee the public an opportunity to participate meaningfully in permitting decisions at coal ash dump sites, including during the siting, closure, expansion and cleanup of units, as well as during any renewals or modifications of these waste permits. Consider environmental justice and avoid disproportionate impact of coal ash disposal on low-income communities and communities of color and ensure that such communities have a voice in any siting, closure, expansion or cleanup actions. Increase the frequency of groundwater monitoring to at least quarterly, rather than semi-annual monitoring, and require timely and transparent posting of all monitoring data on a publicly available website. The duration of groundwater monitoring, especially in the vicinity of unlined landfills, ponds, and surface impoundments, should extend to the lifetime of the storage unit, rather than an arbitrary 30-year post-closure timeframe. Add boron to the list of pollutants (Appendix IV) that trigger corrective action when groundwater protection standards are exceeded. This will ensure timely and effective groundwater remediation when leaks occur. The U.S. EPA has already proposed doing this, recognizing that boron is one of the leading “risk drivers” associated with coal ash, but has not yet acted on their proposal. Regulate coal ash contamination at the site level, rather than at the level of coal ash units. If groundwater at a coal plant shows coal ash contamination, the owner should be required to clean up the source, regardless of whether the coal ash is in a unit that would be regulated by the CCR rule. 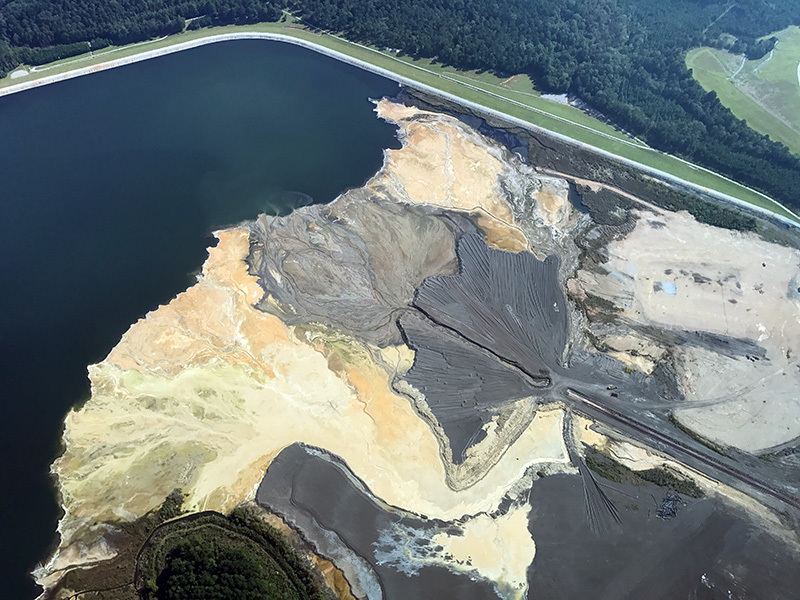 Require timely closure and thorough cleanup at coal ash ponds that violate location standards, including coal ash ponds at Plant Bowen, Hammond, McIntosh, Scherer, Wansley and Yates. Georgia has an opportunity to protect its water resources by administering an effective state permit program. The goals of its program must be crystal clear — to protect both the health of Georgia residents and the quality of their water. The State must also pursue effective enforcement against facilities that fail to comply with coal ash regulations. Plants like Georgia Power's Plant Bowen, Hammond, McIntosh, Scherer, Wansley, and Yates must be investigated to ensure that their coal ash landfills are complying with monitoring and clean up requirements. The quality of Georgia regulations will determine the quality of its water. Lack of adequate rules and weak permits will result in continuing and worsening water contamination. 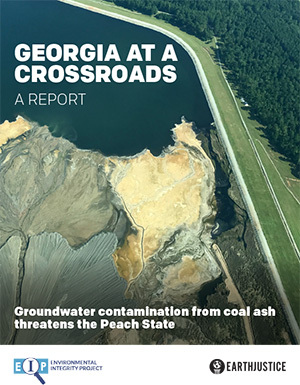 The problems identified in this report need real solutions and firm resolve on the part of state leaders and citizens to demand an end to the pollution of Georgia water by leaking toxic coal ash dumps. Plant Scherer. The widespread nature of the pollution threatens to harm the quality of life for all Georgians who value clean water and healthy rivers and lakes. Report authors Lisa Evans of Earthjustice and Abel Russ of the Environmental Integrity Project acknowledge the following Environmental Integrity Project staff for their help in processesing and analyzing the groundwater data discussed in this report: Courtney Bernhardt, Kira Burkhart, Keene Kelderman, and Ben Kunstman. We would also like to thank Earthjustice staff for their help with research and report development: Daveon Coleman, Rob Chambliss, Flora Champenois, and Shirley Hao. Also invaluable was the assistance from Chris Bowers and April Lipscomb of the Southern Environmental Law Center; Jen Hilburn of the Altamaha Riverkeeper; and Jennette Gayer of Environment Georgia.